These two sessions focused on the Plymouth Award. Karen Turvey introduced the Plymouth Award, its history, current successes and weaknesses and an overview of how the award is administrated, both by students and the CES. Karen identified current issues as: award is a plain certificate, equal award for those who take one year or three, large drop-out numbers, students losing motivation, if students drop-out they lose the award even if two years in. Karen introduced a new points-award system for which she asked for feedback, alongside ideas around how to promote the award, to engage and motivate students who are on the award and ways to improve recording activities on the award (currently: Word, PebblePad, spreadsheet). use of specific events to promote the Plymouth Award. Students who were focused on promotion felt that more information from lecturers, in curriculum and induction, particularly for Stage 1 students who have three years to complete, would be really beneficial. Currently they feel promotion is patchy and that, as the award is in-depth, a mention of it in induction is not always sufficient. A special section of a lecture or specific talk in curriculum would help awareness become embedded and clear. Students also felt that, as it could be seen as a large undertaking to complete the award, they would like to engage in both large events, such as a Plymouth Award fair or/and a Plymouth Award panel or focused meeting in which final stage students, postgraduates or alumni who have completed the award can answer questions and support those students who are considering the award understand all its benefits. They also suggested a ‘Plymouth Award Fair’ that invited voluntary organisations, employers, societies and local charities together to help students access opportunities to support their award. This would mean students who were considering the award had opportunity to sign-up for activities that they can use to contribute towards the award and not feel this was a barrier. The group also suggested a Plymouth Award Society and through this the representatives would be able to promote the award to other students through the fresher’s fair and society events, lectures and social media groups that were created to specifically promote the award and keep students engaged. Pens with pull-out information on the lid and information in an induction pack would be useful to help students gain awareness through materials and not just human resource. student representatives doing more to promote the Plymouth Award to current students. numbers of students dropping out of the programme needs to be reduced – is this down to the complexity of the award? lack of clarity over where information can be found on the CES/University website on activities available to students to help them complete the award. Students focussing on engagement highlighted the individual focus of the award. For example, students may undertake activity in a group, but the recording and undertaking of the award is a very individual activity. This could lead to students feeling like it is an isolative process and is not collaborative with other students. An example of how to change this is to have a Plymouth Award Society (mentioned in promotion) to allow students the opportunity to meet others on the Plymouth Award and get inspiration from others on what activities to undertake to boost their hours. Students like the idea of having other students to talk to about the award and share experiences on best practice in regards to recording their experiences. 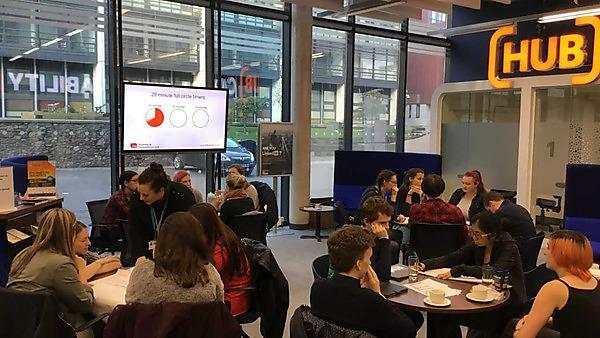 Through this they could organise talks from employers or charities who are looking for people to help and speak to alumni who have completed the award. They also felt that the society could have chat forums to help share ideas – as well as on social media and dedicated sharing groups. The group suggested it may be good to have a newsletter that Karen sends out with ideas and inspiration to motivate people into completing the award. This could include ideas for completing your hours and profiles of students who are doing interesting things to complete their award. This would also help promote other CES activities. Facebook communication and sharing good news stories was also a popular suggestion. Students also felt that, as it could be seen as a large undertaking to complete the award, they would like to engage in both large events, such as a Plymouth Award fair or/and a Plymouth Award Panel or focused meeting in which final stage students, postgraduates or alumni who have completed the award can answer questions and support those students who are considering the award understand all its benefits. In order to keep students motivated to record their hours and encouraged to keep progressing with the award, a group suggested an automated update or hours barometer to highlight milestones on the award, would an encouraging motivation. A platform that encouraged you to visualise the number of hours you have logged would make the award more tangible and encouraging. Updates when you have achieved certain milestones by email would help remind people to stay encouraged to keep going with the award. A celebration or awards dinner for each completing group would also boost motivation and a feeling of achievement whilst on the award and to encourage students to complete knowing that there is an end goal and celebration of their hard work. A LinkedIn group would help alumni and current students on the Plymouth Award to stay in touch and share ideas. Alumni may even be in employment with organisations that are able to offer some experience to current students. In addition: groups felt that recognition at graduation was something promised in the literature, but it was not clear what this meant. Karen reiterated that you receive a certificate in with your graduation certificate, but that you did not get a special mention. Groups felt that this would encourage participation if they knew it would be mentioned. We discussed Plymouth Extra and how this is a useful tool to search for activity. newsletter from Karen Turvey to keep students updated on good practice and ideas on how students can boost their hours on the award with upcoming events. categories of recording for student on the award. Generally students felt that there were too many ways to record their activity on the Plymouth Award and that the options of Career Navigator, PebblePad or a word document did not give clarity to how work should be submitted. The creation of a platform that allows you to log your activity with a visual counter and help to categorise activity was needed. Students liked the idea of a bronze, silver or gold award that can be administrated at each stage. This would help students to clarify what they have achieved at each stage, give some finalisation to the year and help them to monitor their activity more closely. This could be in the form of a written report at each stage or a reflective log. The awards system will allow students who are not able to continue for three years to be able to have a tangible record of their yearly achievement. Therefore they are less likely to give-up in the process. A points system for each category of activity was suggested by Karen in the presentation but none of the groups present supported this and preferred the logging of hours. Most students felt that the categories of each activity was positive and they liked the clarity. They would like more advertising of activities they can undertake to have the category that they fit in made clear. They felt a progressive rewards scheme or special recognition for recording hours was a positive idea. 1. Platform created to streamline recording of hours and with a widget to visualise completed hours. 2. A staggered submission timeline at each stage of degree, awarding bronze, silver and gold awards. 3. More clarity on University-based activities on which category they could include them in their award.